YogaBellies for Pregnancy sessions are unique prenatal yoga classes, where Silvia uses traditional yoga postures (asanas), adapted and beneficial for pregnancy and the common ailments associated with pregnancy. 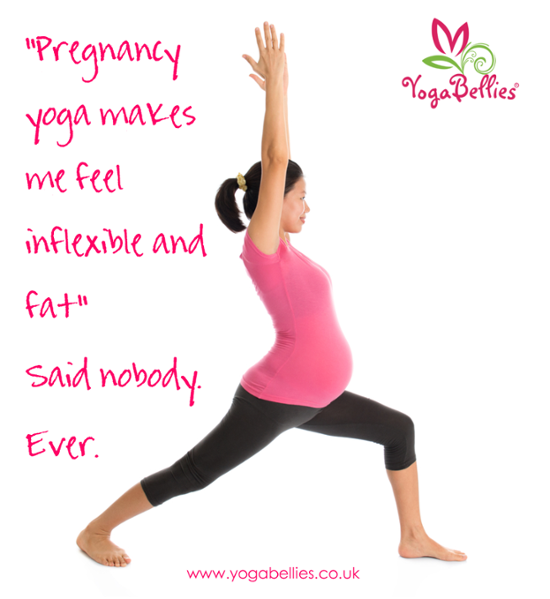 YogaBellies for Pregnancy classes also include a specially created combination of self-hypnosis, yoga nidra (deep relaxation) and breathing techniques for pregnancy and birth (pranayama). Classes are open to all healthy pregnant women, regardless of current yoga practice or experience. If you have any pre-existing medical conditions or have had any serious problems during pregnancy, please run this past your GP before starting the class and discuss with your Silvia. Please don’t worry if you have never done yoga before, a lot of the mums will be trying it for the first time and our classes are suitable for all levels. Courses run in a rolling block (meaning you can start any week spaces are available) of eight classes and therefore sessions are booked in blocks in advance. The cost of your course includes a YogaBellies for Pregnancy Pack, customized for the class you are attending, comprising of a tote bag, downloads including yoga videos to practise at home, discounts, local information, and much more. You are not just booking a class here, but a complete yoga journey.